Raid on Finsbury Park Mosque. [Source: BBC]The Metropolitan Police mount an early morning raid on Finsbury Park mosque, sending in 200 officers. Decision to Launch - The raid is primarily the result of intelligence about Kamal Bourgass, a man implicated in an alleged ricin plot (see September 18, 2002-January 3, 2003). Bourgass was in possession of an envelope with instructions in Arabic for manufacturing poisons and explosives, as well as lists of chemicals, discovered by police during a raid in Wood Green days earlier (see January 5, 2003). These “poison recipes” were in Bourgass’s writing, and the envelope had the address of the Finsbury Park Mosque with the name of “Nadir,” an alias used by Bourgass. [Observer, 4/17/2005; O'Neill and McGrory, 2006, pp. 254] Like other illegal immigrants, Bourgass had used the mosque as a place to stay and as his postal address for correspondence with the immigration service. He had stayed there in the weeks before his attempts to make ricin were discovered. [BBC, 2/7/2006] In addition, one of many suspects detained by the police around Britain at this time tells police that the photocopier in the mosque’s office had been used to copy some “recipes” written by Bourgass. Other suspects detained have links to the mosque, and have worked or slept there. Finally, two suspects the police want to detain are known to sleep in the mosque’s basement. Searches, Discoveries - Armored officers batter down the doors to begin days of searches. In addition, they make seven arrests. 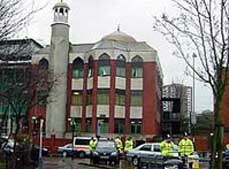 After the trial and conviction of radical cleric Abu Hamza al-Masri for hate crimes in February 2006, police will reveal their discoveries from the raid. The police uncover chemical weapons protection suits, pistols, CS spray, and a stun gun. Other military paraphernalia include a gas mask, handcuffs, hunting knives, and a walkie-talkie. The police also find more than 100 stolen or forged passports and identity documents, credit cards, laminating equipment, and checkbooks hidden in the ceiling and under rugs, as well as more than $6,000 in cash. A senior police officer will say, “The fact that they were happy to keep this sort of stuff in the building is an indication of how safe and secure they felt they were inside.” Authors Daniel McGrory and Sean O’Neill will comment, “This was exactly the kind of material that informants like Reda Hassaine had told the intelligence services about years before” (see 1995-April 21, 2000).